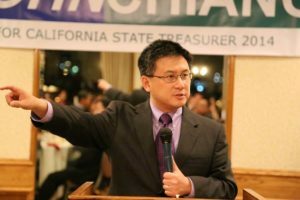 State Treasurer John Chiang announced Tuesday that he will run for governor. Chiang is the second state office holder to join the 2018 race to replace Gov. Jerry Brown. California Lt. Gov. Gavin Newsom, who is already fundraising for the 2018 election, is the leading candidate in the race. Both Chiang and Newsom are Democrats. Other Democrats who may enter the race include Antonio Villaraigosa, the former mayor of Los Angeles; Steve Wesley, a former state controller; Eric Garcetti, the current mayor of Los Angeles; and Tom Steyer, a billionaire hedge fund manager and environmentalist. Republicans Kevin Faulconer, the mayor of San Diego; Ashley Swearengin, the mayor of Fresno; and Carly Fiorina; a recent presidential candidate are also possible candidates. Chiang was elected state treasurer in 2014. He previously served eight years as state controller. In 2011, while serving as state controller, Chiang withheld pay from California legislators in order to hold them accountable for failing to pass a balanced budget by a June 15 deadline. Chiang also identified more than $9 billion in waste and mismanagement through audits conducted while he was the state controller, according to a news release issued by his campaign. In 2014, Chiang released an audit of 11 state and local government agencies where pension spiking was occurring. The audit indicated that taxpayers and local governments are on the hook to pay nearly $800 million from legal pension spring over the next two decades. Chiang, 53, is the son of immigrants from Taiwan. He grew up in a Chicago suburb and began his career as a tax law specialist. Chiang has also worked as an attorney for then-state controller Gray Davis and a staff member for Senator Barbara Boxer. He served several years on the State Board of Equalization before running for controller. Not sure having the top money person from a state with billions in underfunded pensions and a crumbling infrastructure is a wise choice to run the state, unless you just want even more debt and a worse infrastructure. What a wonderful assortment from which to choose!……….NOT! For me it will be a lot like the presidential race, (anybody but Hillary), for governor it’s anybody but Newsom! Multiculturalism…is it good or bad for California and this nation? I’m beginning to wonder. Looks what it`s done to Europe.